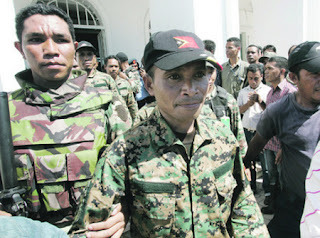 Today Online 05:55 AM Nov 03, 2010 GLENO (East Timor) - Gastao Salsinha (left), retired rebel and failed assassin, says it is probably politics that explain why he is free to roam East Timor's cloud-covered hinterlands rather than languish in prison. Salsinha was the most senior of 24 rebels convicted this year of trying to murder President Jose Ramos-Horta (right) and Prime Minister Xanana Gusmao in twin attacks in 2008. But even as a court in Dili, the capital, sentenced him in March to more than 10 years in prison, Salsinha, a former army lieutenant, looked forward to certain release. Mr Ramos-Horta - who was left bleeding and near death with gunshot wounds outside his home - had promised forgiveness in August when he commuted the sentences of the 23 rebels in custody. The Timorese Constitution grants the president the right to issue pardons and commutations "after consultation with the government". The opposition, rights groups and the United Nations reacted with dismay, saying the decision undermined the rule of law. "For us, this is a direct effort to minimise the meaning and essence of national law in Timor-Leste," said Mr Luis de Oliveira Sampaio, the director of the Judicial System Monitoring Programme, a non-governmental organisation in Dili, referring to the country by its official name. Even Salsinha, sitting outside a relative's home in the hilly western district of Ermera, said that the president probably had overstepped his constitutional power to grant commutations. "But because there's been political intervention, anything can happen," he said, smiling shyly. To critics, the release of Salsinha and his men is the latest example of crime without punishment in East Timor. Since his election in 2007, Mr Ramos-Horta has drastically increased pardons and commutations, prompting criticism that he has undermined efforts to punish those responsible for crimes during Indonesia's bloody 24-year occupation, as well as during instability since independence in 2002. But for the government, and Mr Ramos-Horta, a Nobel Peace laureate, the pardons are about mercy and reconciliation in Asia's newest and poorest country. With giant Indonesia just across the border, and local divisions still strong, there is another calculation, critics say: A blank slate can buy peace and stability. According to the United Nations mission in East Timor, Mr Ramos-Horta has issued 217 pardons or commutations since 2007. In a casual interview as he was strolling outside his office building in Dili, Mr Ramos-Horta said that in the case of Salsinha's men, forgiveness, and preventing a return to instability, trumped punitive justice. They were victims of the breakdown in the political system, he said, a crisis not of their making and for which they should not be punished. He said he rejected the argument "that if you forgive people who have been tried, who have faced the whole justice process, and who faced two, three years in prison, you foster a kind of impunity". "You can say that when you put up that question to me, I laugh," he said.